Love the way tis guy makes the 'old guard", on both sides of the aisle, squirm because they know he's on the right track. Just call Sen Cruz the HAMMER!! He lives in their heads… rent free. Addressed to Harvard president Drew Faust, the petition argues that Cruz’s efforts are a waste of taxpayer money and make a mockery of the university, as well as the Senate. The petition asks that, along with rescinding Cruz’s diploma, the university make a statement saying that his time at Harvard had no effect on him or his views. The petition currently stands at 30 signatures with some appearing to be done in jest by Cruz supporters. I'm surprised that even Cruz's Republican friends don't have the balls of a man to defund ObamaCare. The USA is going to be turned into British Columbia... Unionized Part time works needing to hold down 2 jobs to make a living and pay for their own over priced health care.. He was so appalled that he had to run to the nearest news cameras and tell them all about it. WASHINGTON — Sen. Chuck Schumer (D-N.Y.) said he couldn’t believe his ears when Sen. Ted Cruz (R-Texas) read the Dr. Seuss classic Green Eggs and Ham aloud during his 21-hour talk-a-thon that kicked off Tuesday afternoon on the Senate floor. Cruz said the children’s book is one of his favorites, and he read it in its entirety as part of his effort to delay action on a bill to defund Obamacare. Cruz supports defunding Obamacare, but was trying to drag out debate to prevent Democrats from killing the bill. But Schumer said Cruz completely missed the point of the story. Alberta the best place in North America to live, second only to Texas of course. This is an odd choice of a book for Senator Cruz to read in that its message actually supports the position of the Democrats that the Affordable Care Act (otherwise known as Obamacare) should be allowed to go into effect as scheduled. Then the narrator, after much urging by Sam-I-Am, eats the green eggs and ham to prove Sam-I-Am wrong. However, much to the narrator's surprise, he actually likes Green Eggs and Ham. The narrator then goes on to actually thank Sam-I-Am for encouraging him to try the Green Eggs and Ham. Senator Cruz-Obamacare is like Green Eggs and Ham. Like the narrator in the story, some people have come to the conclusion (after hearing a lot of right wing propaganda) that they won't like Obamacare even though they have never tried it. A lot of their opposition is based on their fear of trying something different from what they are used to. However, like the narrator in the story, once the American people try Obamacare, I think that they will like it. And like the narrator in the story who thanks Sam-I-Am for forcing him to try the green eggs and ham, I think that the American People will ultimately thank President Obama and the Democrats for Obamacare. When you’re being forced to endure another rabid Sen. Ted Cruz on Obamacare’s threat to human freedom, it’s easy to forget how absurd our health-care debate seems to the rest of the civilized world. That’s why it’s bracing to check in with red-blooded, high testosterone capitalists north of the border in Canada — business leaders who love Canada’s single-payer system (a regime far to the “left” of Obamacare) and see it as perfectly consistent with free market capitalism. Take David Beatty , a 70-year-old Toronto native who ran food processing giant Weston Foods and a holding company called the Gardiner Group during a career that has included service on more than 30 corporate boards and a recent appointment to the Order of Canada, one of the nation’s highest honors. By temperament and demeanor, Beatty is the kind of tough-minded, suffer-no-fools wealth creator who conservatives typically cheer. Yet over breakfast in Toronto not long ago, Beatty told me how baffled he and Canadian business colleagues are when they listen to the U.S. health-care debate. He cherishes Canada’s single-payer system for its quality and cost-effectiveness (Canada boasts much lower costs per person than the United States). And don’t get him started on the system’s administrative simplicity — you just show your card at the point of service, and that’s it. Though he’s a well-to-do man who can pay for whatever care he wants, Beatty told me he’s relied on the system just as ordinary Canadians do, including for a recent knee replacement operation. The one time he went outside the system was to pay extra for a physical therapist closer to his home than the one to which he’d been assigned. It’s just “common sense” in Beatty’s view that government takes the lead in assuring basic health security for its citizens. He’s amazed at the contortions of the debate in the United States, and wonders why big U.S. companies “want to be in the business of providing health care anyway” (“that’s a government function,” he says simply). Beatty also marvels at the way the U.S. regime’s dysfunction comes to dominate everyday conversation. He shakes his head recalling how much time and passion American friends devoted one evening to comparing notes on their various supplemental Medicare plans. Talk about your sparkling dinner conversation. Roger Martin , another Toronto native and avowed capitalist, spent years as a senior partner at the consulting firm Monitor before becoming dean of the Rotman School of Management at the University of Toronto, where he recently completed a 15-year stint. He advises U.S. corporate icons like Proctor & Gamble and Steelcase. He lived in the United States for years and has experienced both systems first hand. The moral of the story? Don’t let the rants of cynical demagogues like Cruz confuse you — it is entirely possible to be a freedom loving capitalist and also believe in a strong government role in health care. Remember, Obamacare features a much smaller such role than does Canada’s approach — or England’s, where Margaret Thatcher would have been chased from office for proposing anything as radically conservative as the Affordable Care Act. Matt Miller never met a gubmint program he didn't like. Cruz's work is paying off. Sen. Ted Cruz is outraged—outraged—about the negative impact Obamacare is having on the lives of people like John Connelly. bludgeon the president and the Affordable Care Act. go to because of Obamacare.'" cut Pell Grants, raised federal student loan payments, and cut funding for community colleges and historically black colleges . Clearly Cruz is just up to his eyeballs in concern for people like Connelly. MSNBC and Think Progress are both impeccable sources. Is Christian Dominionism behind the Government Shutdown? In the months building up to the present showdown, Cruz has been giving speeches at Tea Party rallies and other religious right gatherings as part of a campaign to defund Obamacare. In watching the speeches, I can see how his status as a Cuban American refugee fits the ethos of the far right culture warrior movement perfectly. He is able to shift seamlessly from stories about the oppression of the Castro regime to talking about the Obama administration. U.S. Sen. Ted Cruz—whose father is Rafael Cruz, a rabid right-wing Christian preacher and the director of the Purifying Fire International ministry—and legions of the senator’s wealthy supporters, some of whom orchestrated the shutdown, are rooted in a radical Christian ideology known as Dominionism or Christian Reconstructionism. This ideology calls on anointed “Christian” leaders to take over the state and make the goals and laws of the nation “biblical.” It seeks to reduce government to organizing little more than defense, internal security and the protection of property rights. It fuses with the Christian religion the iconography and language of American imperialism and nationalism, along with the cruelest aspects of corporate capitalism. The intellectual and moral hollowness of the ideology, its flagrant distortion and misuse of the Bible, the contradictions that abound within it—its leaders champion small government and a large military, as if the military is not part of government—and its laughable pseudoscience are impervious to reason and fact. And that is why the movement is dangerous. The cult of masculinity, as in all fascist movements, pervades the ideology of the Christian right. The movement uses religion to sanctify military and heroic “virtues,” glorify blind obedience and order over reason and conscience, and pander to the euphoria of collective emotions. Feminism and homosexuality, believers are told, have rendered the American male physically and spiritually impotent. Jesus, for the Christian right, is a man of action, casting out demons, battling the Antichrist, attacking hypocrites and ultimately slaying nonbelievers. And leading the avenging armies is an angry, violent Messiah who dooms billions of apostates to death. “I could have written this story from day one. If you follow the Cruz plan, you end up exactly where we are,” Rep. Adam Kinzinger said. While Sen. Ted Cruz tries to spin the 16-day government shutdown as a moral victory for him and his conservative followers, a seething, bitter anger has been building among the House Republicans who followed him into the fight. GOP lawmakers had hoped to avoid a shutdown and use the funding fight to squeeze some concessions from Democrats on the budget. But that was until Cruz launched his quixotic campaign to defund Obamacare — rallying the conference’s tea party hardliners and forcing Speaker John Boehner and other leaders along for the ride. Not only did Cruz’s crusade badly damage public perceptions of Congressional Republicans, it left them with a worse deal than they likely would have gotten if they had never shut down the government. New York Rep. Peter King has long been one of Cruz’s loudest critics since the push to defund Obamacare began (and even before that), and he left the Republican conference Wednesday morning with an I-told-you-so attitude. Others said House Republicans should shoulder some of the blame for following Cruz in the first place. Cruz still holds considerable sway among House conservatives, who rallied around his cause. But even within the ranks of the conference’s most ideologically pure, there’s frustration with the path Cruz led them down. “You can’t just pull the pin on the grenade, roll it in the tent, and walk away,” one conservative Republican said. “There’s real frustration” within the House Republican conference, the lawmaker added. Rep. Ron DeSantis, however, acknowledged that making defunding Obamacare the primary rallying cry obscured more realistic goals, including eliminating an employee subsidy for lawmakers and their staff and delaying the individual mandate for one year. “We didn’t articulate that well. It got kind of lost in the initial defund push,” DeSantis said Wednesday. Republican Rep. Reid Ribble of Wisconsin, without calling out Cruz specifically, said that part of the issue leading up to the shutdown was the fact that House and Senate Republicans were not on the same page and divisions spilled out into the open. After the Senate deal was announced, Republicans had virtually nothing to show at the end of the two-week shutdown. Cruz was swarmed by reporters in the Capitol who asked if the GOP civil war that had broken out had been worth it when in the end very little had changed, except for Republican poll numbers which have tanked considerably. If there was any blame to go around, Cruz said, it belonged to Senate Republicans. Cruz had launched into a 21-hour filibuster a few weeks ago, urging his colleagues to vote against a procedural vote. Republicans were nervous that Cruz would employ a filibuster-esque tactic to delay passage of the deal in the Senate. But Cruz relented, saying he understood it would not effect the outcome in this case. Cruz said that he would continue to fight against Obamacare, but did not hint explicitly how he intends to do that. A House GOP aide said that a lot of members have come away from the shutdown experience, cognizant that their strategy needs to improve moving forward. I do so like mean rage and spam. I do!! I like mayhem, CRUDZ-I-am! Very popular in a very populous state. I've never seen the guy, but let me guess; a loudmouthed buffoon cut from the Rush Limbaugh school of hot air. Am I getting warm? No, but you are showing your prejudice or perhaps even your bigotry. Funny thing is he is getting more criticism from fellow Republicans than from Democrats. with a few liberal thoughts at times. long way from when they came to life. war on a credit card a war that didn't need to happen.. The USA is going to be turned into British Columbia. Do you want to borrow more against your children's future ? 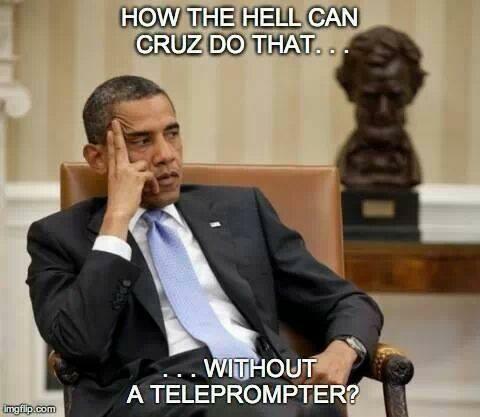 Neither does Cruz. But you are responsible while Cruz is unhinged , is that about right ? Why do you never answer, have you mortgaged your children's future ?